Côte d’Ivoire’s brown gold has gradually destroyed the country’s national parks and protected forests. At the same time, suspicions of corruption are tainting the authorities’ attempts to curb rampant deforestation. Trucks laden with logs negotiate the rutted road along the boundaries of Marahoué National Park between the towns of Bouaflé and Daloa. When first designated a park back in 1968, it boasted 101,000 hectares of forest and was home to a rich fauna of elephants, hippos and chimpanzees. Some trees remain along the roadside, but illegal cocoa farms have invaded the area, decimating the fauna and flora. The vain attempts at tourism infrastructure, partly funded by the European Union, have long since fallen into disuse. The degradation of the so-called protected natural park began no sooner than it was designated. At the time, a handful of cocoa farmers were settled in the future reserve and, given the absence of any resettlement solution, they stayed on. The expansion of the plantations in line with the arrival of new planters led to the gradual degradation of the forest cover, of which only vestiges remain today. Fifty-something Kouadio N’Guessan farms a few hectares of cocoa trees within the boundaries of Marahoué National Park. “My family arrived in 1958,” he explains. In his village, a handful of small planters live from the sale of their products in the village of Bouaflé, from where the cargoes of beans are then transported to the ports of Abidjan or San Pedro, before leaving for the international market. “But this isn’t part of the park, it begins further away,” claims Kouadio N’Guessan. 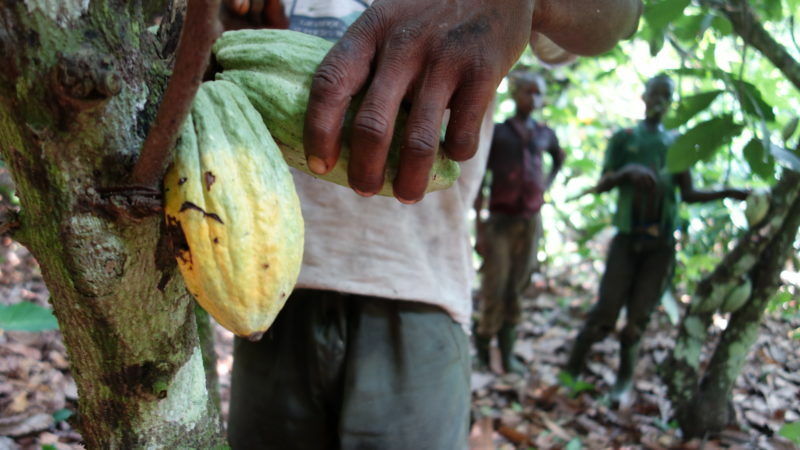 Cocoa farming may be illegal, but it is widespread. And the parallel cocoa economy has become a fixture on the landscape. To obtain the right to farm a plot, foreign planters – mainly from Burkina Faso – must pay the local populations a sum of between 75,000 and 150,000 CFA Francs (€115-230) depending on the quality of the land. “In the parks and classified forests, cocoa grows much better and the bean count is better. That’s why planters settle there,” explains Fatmé Ghaddar, who runs a cocoa cooperative based in Man. Those too poor to pay for a plot concession rent out their services as farm labourers for extremely low wages, around €400 per year. 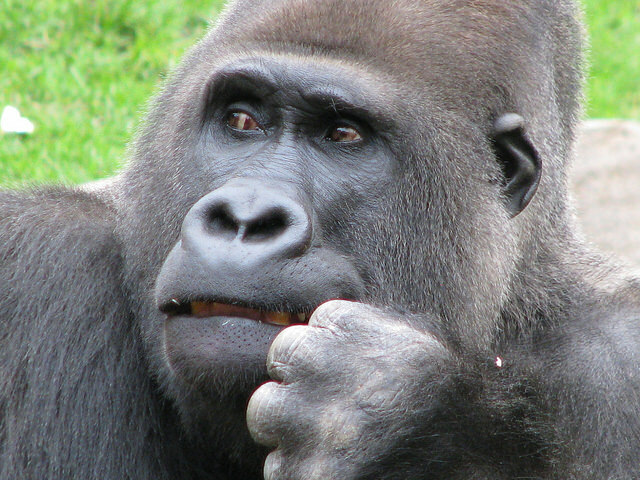 The situation of Marahoué National Park is no exception in Côte d’Ivoire, where it is common for protected areas to be devoured by the expansion of cocoa farming, the country’s main resource. Over the past decade, deforestation has destroyed around 2.1 million hectares of forest, at least a third of which is directly due to cocoa farming. And the overall picture since 1960 is even grimmer… Côte d’Ivoire has destroyed three-quarters of its forest cover in that time. Moreover, this rampant deforestation continues to support the country’s economy. Cocoa accounts for around 40% of the country’s export earnings and 10% of gross domestic product (GDP). It provides a livelihood for some six million Ivorians. Within Marahoué National Park alone, tens of thousands of people now live from the cocoa plantations that have encroached on most of the park. 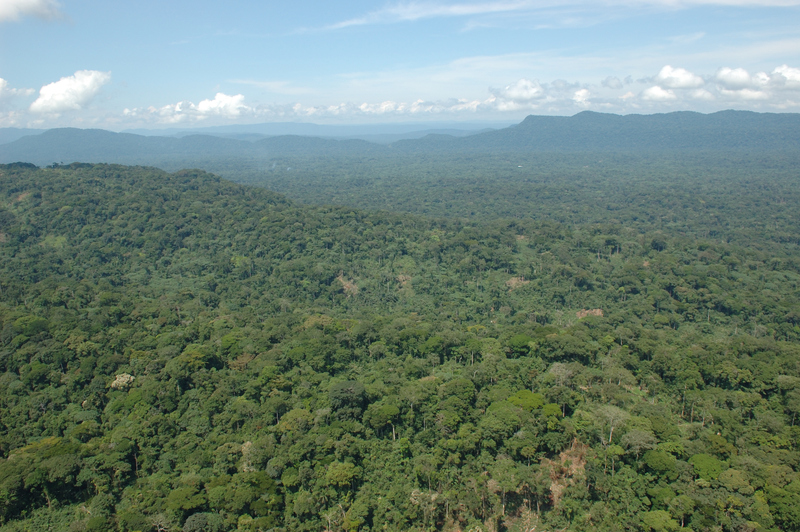 However, political pressure to put an end to the degradation of Ivorian forests has recently stepped up a notch, especially in the wake of the Paris Agreement on Climate Change. 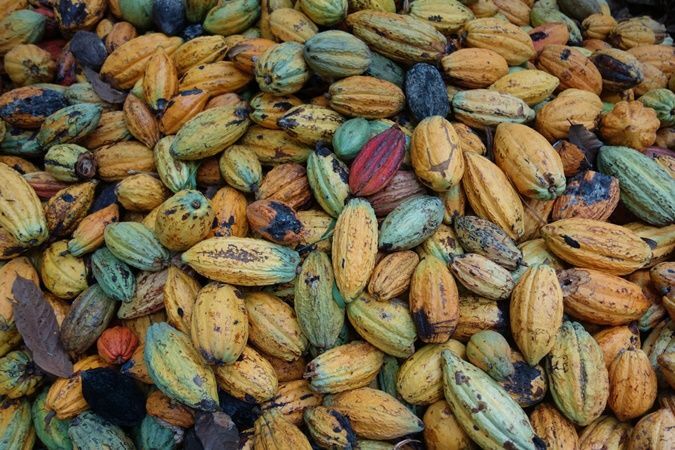 This has prompted the Ivorian government to make efforts to clean up its combat against deforestation and, at last year’s COP23, it signed up for the Cocoa and Forests Initiative, which brings together the two top cocoa-producing countries, Côte d’Ivoire and Guinea, the world’s leading chocolate and cocoa companies and civil society actors around a common agenda. An initiative celebrated in Bonn last November, despite a certain degree of cynicism. “Now that all the forest is gone, it’s easy to agree to protect it,” grumbled one environmentalist in the corridors of the climate conference. Developing countries will commit to protecting their forests in return for financial compensation from the big polluters. But deforestation will not appear in a binding Paris agreement. EURACTIV France reports. Within Marahoué National Park, the fight against degradation has nevertheless picked up speed in recent months. At the end of 2016, the Office Ivoirien des Parcs et Réserves (OIPR), the authority responsible for national parks in Côte d’Ivoire, concluded an eviction agreement with the occupants of the site and started work on destroying the villages. “Zone after zone or at the same time, all the human dwellings inside the park are set to give way to nature. The populations are informed of these facts, they will be alerted so that they leave this protected area either of their own will or by force,” insists Rémy Kouassi Kouadio, Senior Waters and Forests Engineer with the OIPR. The village of Zamanamakro, which had been home to up to 10,000 people, has already been evacuated by the OIPR. The permanent houses, the “maquis” as the bars are known, the church and the school built by the inhabitants have been razed to the ground. 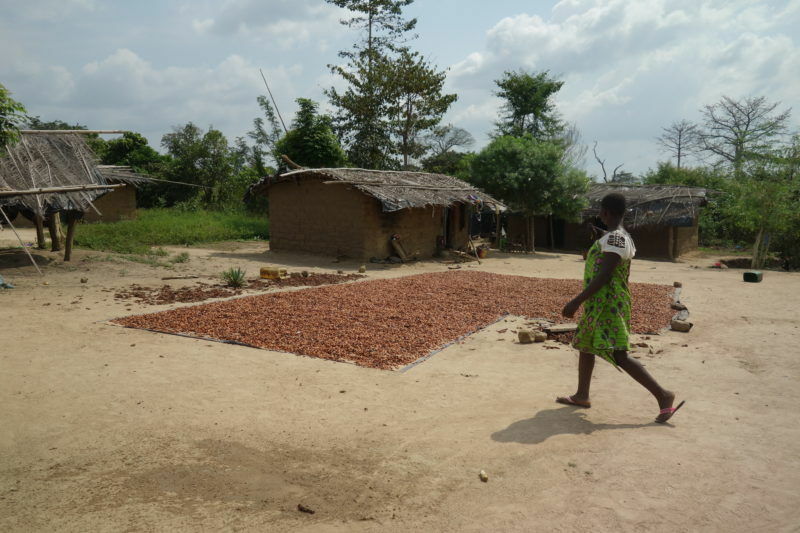 The cocoa plantations are still visible from the ruins of the village, the pods drying at the foot of the trees. Zamanamakro may have been deserted, but the planters have relocated within the surrounding area or outside the park, and return to farm their plots. For Norbert Django, a Burkinabe who was evicted from the village and now lives in Dianfa, the forced departure leaves a bitter taste, because no alternative was offered. “There are some who are still in the park, in other villages, some are here outside and come back to take care of the cocoa trees. Some went back to Burkina Faso,” he tells us. His plantations have been abandoned since the eviction, “because I no longer go into the park, you have to pay a lot of money to go and harvest your crop”, he says. According to several inhabitants of the area, the OIPR agents have set up a system of extortion. Illegal farmers allegedly have to pay between 100,000 and 200,000 CFA francs (between €150 and €300) to access the plantations in the park. This information, obtained from several planters, has been vehemently denied by the OIPR. “This is a pure invention of people who can no longer access their plantations […]. It is intended to discredit the agents to sabotage the restoration process that is underway,” responds Rémy Kouassi Kouadio. Between the corruption and the lack of financial means, the reforestation of Marahoué National Park looks like little more than a pipe dream. With a team of eight people, the OIPR intends to rehabilitate one-third of the park at first. A goal that would leave by the wayside thousands of people living from cocoa crops, with no resettlement policy in sight.